As of Thursday, an awful lot of people are happy. The Diamondbacks are happy, because they were able to move Justin Upton for value. The Braves are happy, because they were able to get Justin Upton for a good but not outstanding package. And Justin Upton is happy, because he gets to go play in Atlanta, instead of Seattle or somewhere else. Upton was hoping for a destination like this, if not this destination specifically, and now he can put his alleged malcontent days behind him and play alongside his brother. This is a move that felt like it had to be made, and now it’s been made, officially. But from the Braves’ perspective, there are not zero concerns. For one thing, now they’re down a Martin Prado, and their third-base situation could be stronger than it is. And then there’s the matter of Upton, and the strikeouts that he brings. He’ll share an outfield with B.J. Upton, who strikes out, and Jason Heyward, who strikes out too. There’s been some degree of concern that the new Braves might strike out too often, which means there’s concern that the Braves’ offense might underachieve. Immediately, one should note that Justin Upton isn’t exactly strikeout-prone. His strikeout rate the last two years is about 19%. The league-average strikeout rate the last two years is about 19%. Upton shows a lot of strikeouts if you look at his strikeouts as a counting stat, but that’s because he gets a lot of plate appearances, and all we should really care about are rates. Other people have struck out way more often than Justin Upton has. But we can look at the Braves, and strikeouts, and runs scored, anyway. Don’t forget that the Braves have Dan Uggla, and at present they stand to play a lot of Juan Francisco. There’ll be whiffs. If the Braves’ offense were to underachieve on account of its strikeouts, we’d think their runs scored wouldn’t match up with their overall team wOBA. 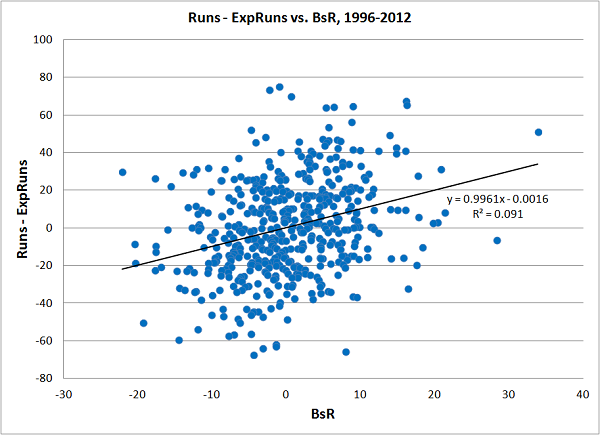 First, let’s examine the recent relationship between wOBA and team runs scored. 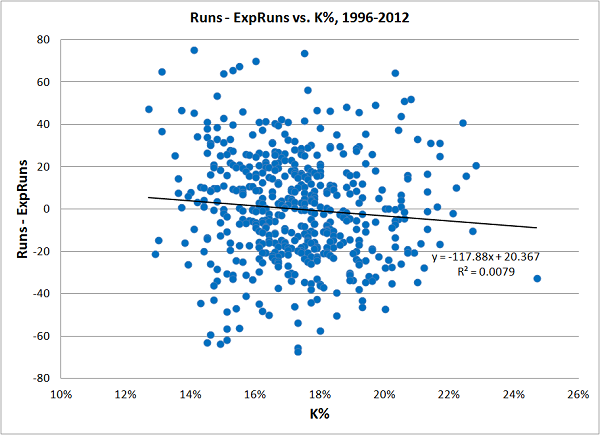 We’re doing this very simply: raw runs vs. wOBA, 1996-2012, post-strike and eliminating the abbreviated 1995 year. We have a sample size of 506 individual team seasons. If we wanted, we could get a little more detailed, but this does well enough. 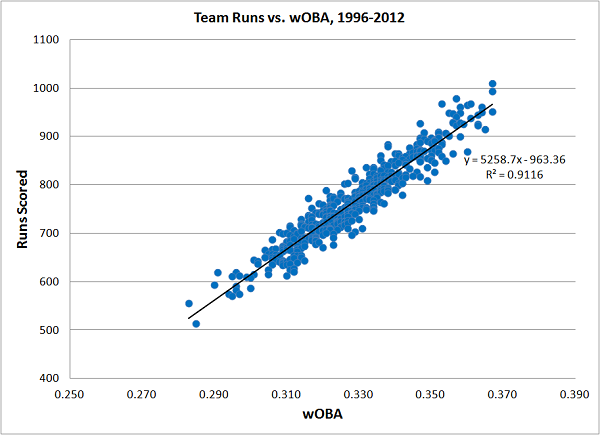 There is, obviously, a very strong relationship between wOBA and team runs scored. Nothing about that should come as a surprise. Teams fall on either side of the best-fit line, but no one’s that far off. There’s never been any such thing as a team with a productive offense and a bad wOBA, or a team with an unproductive offense and a good wOBA. Post a decent wOBA and the runs scored will follow. There’s hardly any relationship at all. There’s a very slight downward slope, as strikeout rate increases, but it’s practically meaningless. There’s no evidence here that a team with a high strikeout rate will underachieve to a great degree. We can look at things another way. Over the window, 50 teams posted a strikeout rate of at least 20%. They averaged 1.3 more runs scored than expected runs scored. Meanwhile, 57 teams posted a strikeout rate below 15%. They averaged 6.3 more runs scored than expected runs scored. If there’s an effect here, it’s so small that it barely even matters. Strikeouts are not offensively crippling. The groups are in descending order of difference between runs and expected runs. By wOBA, the groups are virtually identical, and by strikeout rate, they’re virtually identical, too. We see a small pattern in the final column, though, corresponding to baserunning. So there’s some effect there, even if a lot of the difference between runs and expected runs can probably be chalked up to luck, or, if you prefer, unsustainable timing. Why does this matter for the Braves? Justin Upton, historically has been an above-average baserunner. So has B.J. Upton. To whatever extent the Uptons might squander the occasional productive-out situation, they’ll also contribute on the basepaths, presumably offsetting any effect and maybe then some. We know that baserunning matters, here. More in one direction than strikeouts seem to matter in the other direction. The Braves, as a team, are probably going to post a strikeout rate that’s above the league average. But whatever their team wOBA turns out to be, the runs scored will follow, and the strikeouts won’t make much of a difference. At times, the Braves’ strikeouts might be frustrating, but they’re still going to score, and they’re still likely to be one of the very best teams in the league. We hoped you liked reading Justin Upton, the Braves, and their Strikeouts by Jeff Sullivan! The Oakland A’s hitters led MLB in strikeouts last year and made the playoffs, that’s all I’ll ever need to think about on the topic. They didn’t just lead MLB, they trashed the AL record (although 2013 A’s will have their say soon). And on the flip side the 3 AL teams with the fewest strikeouts all lost at least 90 games and scored below the AL average. KC, Min, Cle.